Violence and cannibalism in a form you don’t have to feel guilty about. To the more aggressive go the spoils (and food). Finally, here is a game where you can destroy your enemy, and eat them for breakfast as well. Because after all nothing says victory like a nice raw piece of your opponents thorax. became the dominate life form, pushing out all other types of complex life. were more adaptive then the individual insects they competed against. supported their hives agenda. After millions of years, this constant winnowing of the losers bred hives that looked and operated in similar manners. Each type of hive member had its place in the success or failure of the hive. Those that win can eat - those that lose are the food. 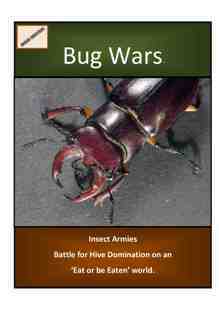 Certainly this provides a simple mechanism of determining a winner and loser in BUG WARS.